Combating the signs of aging. Moisturising and softening the skin. It has smoothing, unifying and luminous effects. 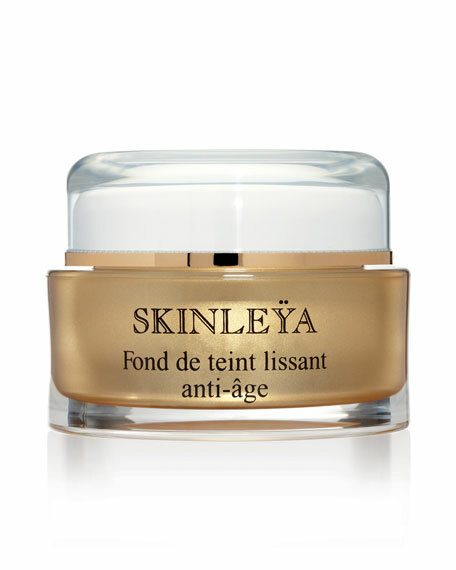 The complexion is refreshed, the skin is beautifully enhanced and radiance is given a new lease of life. Skinleya comes in nine ultra-natural shades for all skin tones.Skinleya is very easy to apply, using the fingertip or brush. Application using the brush allows a subtle, natural finish with no caking. Apply Skinleya with smooth strokes using the foundation brush, strating in the middle and blending outwards towards the hairline, ears and neck. Avoid drawing attention to hollows and shadows (nasolabrial furrows, eye contour, etc.) Can be used alone or a touch of powder applied afterwards. For in-store inquiries, use sku #195622.